Nearly 700 soldiers from the South African defence force have been sent letters of dismissal following last week's strike action. 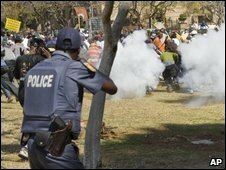 Up to 3,000 military personal clashed with the police on the streets of Pretoria during demonstrations over pay and conditions. The action was condemned by both the defence minister and the secretary general of the ruling party, the ANC. The soldiers' union says the sackings are illegal and will inflame tensions. The image of demonstrating soldiers clashing with the police in the heart of South Africa's administrative capital sent shockwaves throughout the country. The troops left their barracks and marched to the Union Buildings on 26 August, insisting on seeing President Jacob Zuma to seek a 30% pay rise. Police used rubber bullets and teargas to disperse the marchers, who reportedly became unruly and attacked police cars. Now 697 soldiers have been sent letters of dismissal from the defence department, for what the government claims was an illegal protest. Defence Minister Lindiwe Sisulu has condemned their protests as "disgraceful" and a threat to national security. A spokesman for the South African National Defence Union (Sandu) said members who had received letters of dismissal had 10 days to defend their actions. The union is seeking an urgent injunction in the high court to stop soldiers from losing their jobs. It claims some of the letters were sent to military personnel who are currently serving on peacekeeping missions outside South Africa, thousands of miles away. The soldiers' protest last week was the latest in a series of rallies, strikes and disputes over pay and services over the past few months. Several unions have led walkouts, demanding inflation-busting wage rises - and have largely had their demands met. However, the government has said the military is subject to different rules to the rest of society.